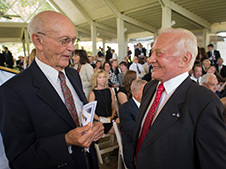 Apollo 11 Astronauts Michael Collins, left, and Buzz Aldrin talk at a private memorial service celebrating the life of Neil Armstrong, Aug. 31, 2012, at the Camargo Club in Cincinnati. Credit: NASA/Bill Ingalls More photos from the Aug. 31 service. WASHINGTON–(ENEWSPF)–August 31, 2012. Today, we pay tribute to a pioneering American; an explorer, a patriot and an individual who, with ‘one small step,’ achieved an impossible dream. Family, friends and colleagues of Neil’s gathered to reflect on his extraordinary life and career, and offer thanks for the many blessings he shared with us along the way. His remarkable achievements will be forever remembered, and his grace and humility will always be admired. As we take the next giant leap forward in human exploration of our vast universe, we stand on the shoulders of this brave, reluctant hero. Neil Armstrong’s first step on the moon paved the way for others to be the ‘first’ to step foot on another planet. We have an obligation to carry on this uniquely American legacy. A grateful nation offers praise and salutes a humble servant who answered the call and dared to dream.